Visitors to Miami typically flock to the beach — but the dynamic and flourishing Wynwood neighborhood is sure to be a destination for years to come. Wynwood is a bustling neighborhood, home to a lively art scene and eclectic murals that have completely revived the warehouse district and brought an incredible amount of activity back into the neighborhood. Wynwood is located due north of downtown Miami, and is bounded by I-195 (North), 20th Street (South), I-95 (East), and the Florida East Coast Railway (West). An example of the cool urban artwork that has come to define Wynwood. Photo City of Miami. During the 1920s, a garment district began taking shape in Wynwood and, at one point, was second only to New York City in fashion production. However in 1980, the neighborhood succumbed to an enormous price surge that drove the value of manufacturing space in the neighborhood through the roof. As economic demands changed, businesses moved out of Wynwood, leaving many of the buildings in the neighborhood desolate. Around 225 clothing retailers and manufacturers moved out, causing the neighborhood to decline. In the late 1990s and early 2000s, Wynwood saw redevelopment. Rehabilitated factories and other industrial buildings have been turned into studios, galleries, bars, restaurants, and creative office spaces that have been saturated with the flair of local artists and performers. 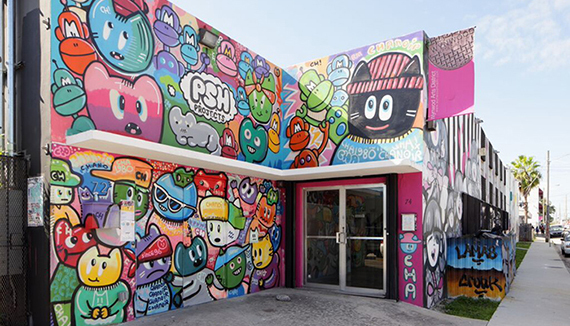 There are over 70 galleries, museums, and collections in the area, in addition to the recently developed Wynwood Walls which attracts pedestrian traffic and allows visitors to experience the neighborhood on foot. Working within the genres of graffiti and street art, over 50 artists have contributed to the Wynwood Walls project. The rapid regeneration of the Wynwood neighborhood has been made possible through a combination of private vision and city partnership. The plans for Wynwood focused on ensuring that community members and business had a stake in the success of the neighborhood to secure a long-lasting future for the neighborhood as an integral part of the Greater Miami area. As Wynwood has become a center for art, fashion, and creative enterprise, Miami actively is working to build a guiding plan for growth while maintaining the character of this unique neighborhood. This outdoor open space exemplifies the kind of funky and creative art that saturates Wynwood. Photo City of Miami. Wynwood is a neighborhood on a meteoric rise. Through public participation and good planning, Wynwood has rapidly transformed from an area of neglect to a bustling, mixed-use, art and innovation mecca. The neighborhood of Wynwood has experienced dramatic highs and lows in its history. For many years, the area was a Puerto Rican enclave known as "Little San Juan." Here, one of the largest garment districts in the United States generated millions of dollars in annual revenue. Yet in the late 1970s, unemployment, poverty, and drug trafficking turned Wynwood into an area of disinvestment and abandonment. It was not until the late 1990s and early 2000s that artists and collectors began to purchase old warehouses for workspace and exhibitions that serious investment began to make its way back into Wynwood. Historically, planning in Wynwood has aimed to find creative solutions to the neglect that resulted from the exodus of warehouse industries. An early example is the Garment Center/ Fashion District Redevelopment Plan made in 1979 that rezoned existing industrial areas to medium-density residential and mixed commercial uses. Later on, Miami's Comprehensive Neighborhood Plans (originally published in 1977, with updates in 1989 and 2013) acted as official guides to future development on a neighborhood level, focusing on attracting employment in the area through zoning incentives, marketing assistance, and beautification strategies. Wynwood has more recently benefitted from the fact that Miami boasts the first citywide form-based code in the nation – the 2009 "Miami 21 Plan" that harnesses New Urbanist and Smart Growth principles. Recent enhancements to Wynwood have focused on sustainable and smart-growth practices. There are four CitiBike bike-share stations scattered throughout Wynwood, and the developing consortium of places to work, eat, and access other services has helped to make the neighborhood extremely walkable and bikeable. Three parks add greenspace to Wynwood, and future plans aim to increase density. Art Wynwood is an annual art fair hosted on Presidents' Day Weekend. Over 60 galleries present the works of both established and up-and-coming artists from nine countries and over 25 cities. Art connoisseurs and travelers take this fair as the best opportunity to discover and explore international contemporary art in the heart of Wynwood. 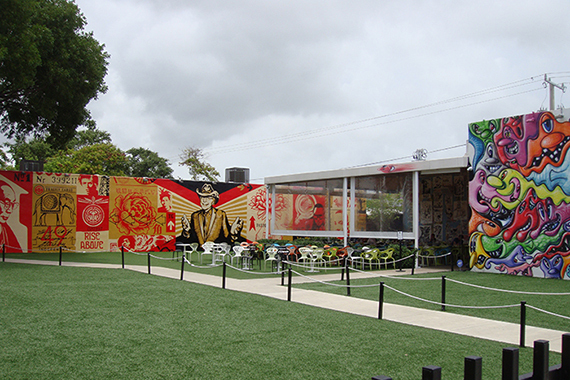 Wynwood Food Tour, by Miami Culinary Tours, hosts a leisurely walk throughout the Wynwood neighborhood. 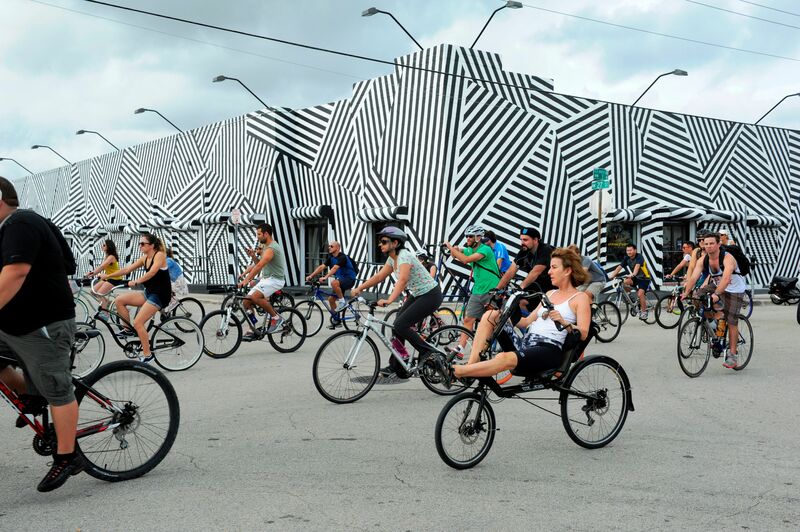 Miami's climate and flat topography make Wynwood a biker-friendly area. New bike-sharing systems are now in place, and the city has plans to reconfigure streets with established bicycle lanes. Photo City of Miami. The City of Miami is working diligently to maintain the artistic vibrancy that has come to define Wynwood while adding to its density, walkability, and variety of uses. The city's Planning and Zoning Department, in collaboration with the Wynwood BID and PlusUrbia Design, is focused on integrating more mixed-use projects, affordable housing, and pedestrian infrastructure into Wynwood through the Wynwood Revitalization District-1. MANA Wynwood Special Area Plan (SAP) — The intent of the SAP is to establish regulations to promote a neighborhood/campus for multicultural, international corporations and institutions to incubate the production and exhibition of art, fashion, and culture; innovative technologies; and light manufacturing products within an approximately 29-acre area. The district's image will support a progressive lifestyle to attract entrepreneurial design and technology uses by promoting innovation in the design of spaces and architecture.